A farm from the 18th century is opening its doors for discover Alsace . 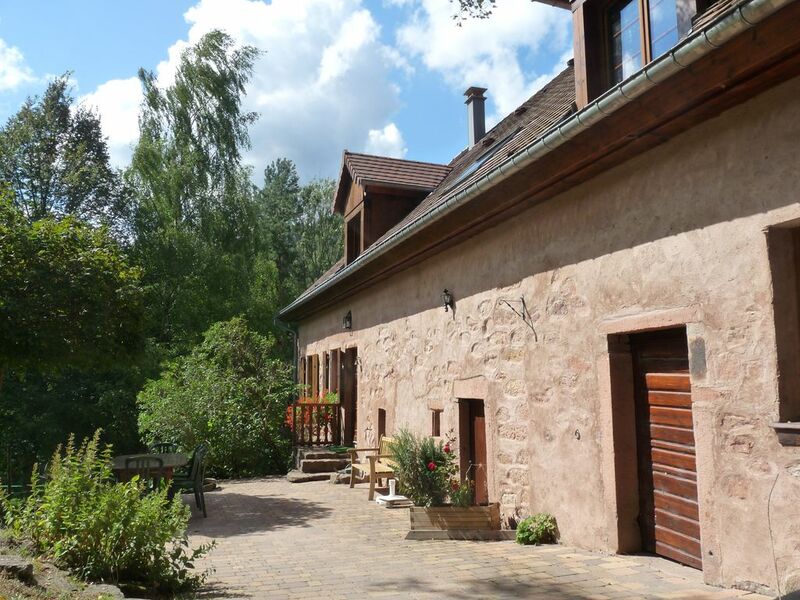 Le Corps de Ferme is located in the hearth of Alsace and nature . Renovated carefully, we wished to keep the authentic aspect of this old farm . You stay between forest and meadow, in the center of Alsace, in the comfort of a gite *** and the heat of freestone, wainscot and country furnitures . Located outside the village (800m away, down a forest track), the « corps de ferme » will plunge you into a world of greenery . Within 15km, the wine route as well as the Meccas of history, gastronomy and culture are awaiting you for thrilling days out . For convenience, you will find in the village of Fouchy a good bakery . In Villé ( 5km) all the local small shops and supermarkets are waiting for you. A farm from the 18th century is opening its doors for discover Alsace . Located between Strasbourg and Colmar, Le "Corps de Ferme" & "La Fermette" will be an ideal starting point for your stay in the middle of countryside, with friends or family, to discover Alsace. You stay between forest and meadow, in the center of Alsace, in the comfort of our gite*** and the heat of freestone, wainscot and country furnitures . Those 2 stone houses are nearby but separated. Terraces & parking of the gite are opposite and protect peace & privacy. Enjoy the beautiful view of the valley from your terrace . The quiet countryside and the everchanging scenery is the environment we live in . Within 15km, the wine route as well as the Meccas of history, gastronomy and culture are awaiting you for thrilling days out . For convenience, you will find in the village of Fouchy a good backery . In Villé ( 5km) all the local small shops and supermarkets. Our donkeys, ponies and horses sometimes liven up the neighbouring prairies by walking around . At our farm, I propose free donkey ride for children and family to discover our valley . The 140 m2 gite can easily accommodate 8 peoples . The living rooms decline on the ground floor . You can go outside though two doorways .The main entrance is on the prairies side of the farm,the other is on fountain side . The 1st floor is divided into 2 differents parts, each part having its own personal stairway with 4 rooms + 2 bathrooms. stone house, (90m2) which housed the bread-oven and the distillery of the farm hosts easily 4 persons . - Lounge – dining room – kitchen are on the ground floor with a access to the terrace . - 2 rooms, a bathroom and separate toilet on the floor. To enjoy this scenery, a set of garden furniture along with deckchairs and a barbecue set are at your disposal . Super für zwei Familien, da jede ihren eigenen Hausteil hat. Sehr gemütlich eigerichtet. Schöne Lage. Vermieterin sehr nett. Dass es Euch bei uns gute gefallen hat, freut uns natürlich sehr. In absoluter Ruhe und wunderschönen Umgebung liegt dieses alte, aber sehr gepflegte Haus. Ich kann es nur weiterempfehlen. Wir waren dort mit 7 erwachsenen Männern und haben das Haus als Ausgangspunkt für Motorradtouren in den Vogesen genutzt. Es fehlte nichts in dem Haus! Mooie woning, volledig ingericht en zeer schoon. Clarisse is heel zorgzaam en vriendelijk voor haar gasten. Vanuit het huis wandel je zo het bos is, heerlijk. Clarisse ist sehr sorgsam und herzlich für ihre Gäste. Vom Haus direct wandern im Wald. Ich kann es meine freunden und famlie sehr empfehlen. Ihr wart super Gäste und wir hoffen, dass wir Euch mal wieder in Fouchy begrüssen dürfen. Sehr nette und freundliche Vermieter! Die Lange des Ferienhaus ist traumhaft. Schön im grünen aber nicht weit weg von Einkaufsmöglichkeiten und Sehenswürdigkeiten. Man kann wunderbare Spaziergänge vom Haus aus unternehmen. Wir können es nur empfehlen! Bis gleich in dezember :-) . Nous avons passé un très agréable séjour au gîte 4 personnes. A notre arrivée, le gîte était propre, accueillant, très bien décoré, on s'y sent bien tout de suite. Clarisse est accueillante, disponible et nous donne de bons conseils pour les visites. Endroit rêvé pour les amoureux de la nature. Nous le recommandons vivement. Ce fut un plaisir de vous recevoir et de vous faire partager " notre " vallon . Mille mercis pour votre sympathique message .Que vous passiez un bon séjour est notre plus belle récompense . Our gites are locateted in the earth of Alsace between Strasbourg and Colmar . Fouchy, little village (700 inhab.) be a part of the 18 municipalities of the valley of Villé . You stay at 450 m of height in a landscape of low mountain range. The wine trail is in your feet. A excellent bakery is located in Fouchy . In Villé (7 mn), you will find all the traditional shops (bank, pharmacy, fuel, post …) and its supermarkets . A traditional market takes place every Wednesday morning in Villé . The Tourism office of Val de Villé is at your disposal too to advise you about the animations of the valley and generaly of Alsace . The val de Villé is a land of legends and history. The quiet nature will appeal to you thanks to the richeness of its wild life .Trades of the past are numerous in the valley, as well as the kirsch distilleries or mountain agriculture . You will discover by the visit of the museum of the Val de Villé in Albé, the jobs of yesterday and of formerly witch make wealth of our region. You stay in a valley where the sport and outdoor activities have a rightfull place . The wealth and the variety of its landscapes offer grounds varied for activities for families or for the most sports. Alsace, earth of history and tradition, abounds in activity and in centre of interest. You will discover a region with a big variety of landscapes from which it ensues architecture and agriculture very varied . The road of wines (in 10mn of Fouchy) stretches of the North in the South of Alsace. Its presents a rosary of magnificent wine growers village with its half-timberings colored houses . The Vosges side presents villages of low mountain range with farm builted with sandstone (like ours) . Voges crest overhang valleys in “alpine” landscapes where cows, walkers and farms liven up the landscape. Le “Ried” and its typical villages of plain is winding by the death branch of the rhin . The castles : Haut Koenigsbourg, the Frankenbourg, Ortenbourg Ramstein or Bilstein still dominate our green valleys. These castles will always be beautiful objective of walk with wonderful points of view. Understand Alsace, its culture, its history through museums, park or commemorative sites. Discover Alsace in the river .